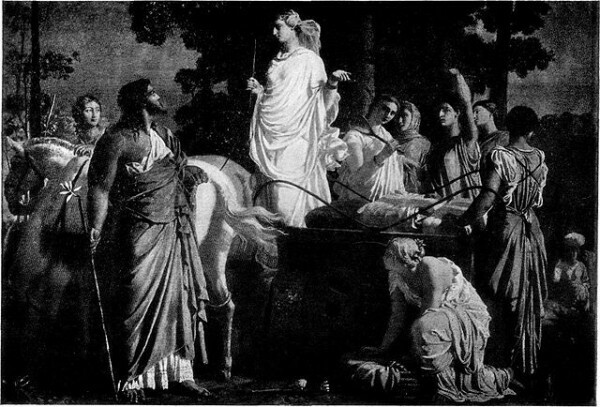 Nausicaa, daughter of Alcinous, wished her fate was to marry Odysseus. She could only hope to marry a man who seemed so god like. A few days after Odysseus had been sent back home to Ithaca on a Phaeacian ship, Nausicaa and her maids with lovely braided hair sat further down, closer to the ocean, the same river they had found Odysseus. As the flawless princess sat close to the edge she noticed the water was dark blue. Nausicaa’s maids sat away from her huddled in a circle chatting about the suitors they heard would court the princess. “There are plenty of fine Phaeacian lords, although none seem to be suitable for our princess. Odysseus himself mistook her for a deathless goddess. If only there were more men like him. Surely no one on this island can meet his attributes.” The eldest of the maids whispered. “You are quite right; the girl surely is young and beautiful. She will have no problem finding a husband.” Another voiced. Nausicaa was carelessly staring into the water, daydreaming about someday finding a man of stature, when she rose too quickly and lost her balance. The maids all too concerned with their conversation, failed to notice her tumble into the river. Not until she hit the water did the white-armed maids look up. By the time they realized what had happened, she had slipped under the water. Immediately the maids prayed to Poseidon, Zeus, and Pallas Athena. Since none of them could swim, two ran quickly to seek help and the others looked for anything buoyant. Time was running out for the helpless princess, and the maids began to weep. Nausicaa still had not resurfaced. Meanwhile under the water, the rapids were violently thrashing the princess around. She tried to fight the current by frantically kicking and moving her arms. The princess was never instructed on how to swim. Her lungs and muscles burned with exhaustion. And with that she gave in to the crashing waves and felt herself sink, soon everything was dark. At that moment Poseidon, who sees all in the ocean and water, stopped the rapids and floated Nausicaa to the surface. A young man who was hunting in the area heard the commotion and rushed to the sobbing maids. Speechless they pointed at the now floating princess. He dove into the water and swam towards the girl. She wasn’t breathing. He dragged her through the calm water until he reached part of the river he could pull her out. A cloak was quickly wrapped around the princess. “You don’t you recognize your princess? She is Nausicaa, Princess of Phaeacia, daughter of King Alcinous himself. Come now we must hurry back to the palace. You must be rewarded for saving the girl, whether she lives or not.” The eldest maid revealed. The young man blamed himself for not running faster to save the princess. The maids all wish they could have saved her. The Queen blamed herself for letting her daughter have so much freedom with her maids, and not closely observing her. And the King, who was the most grief stricken of all blamed Poseidon. He cursed the wretched god and fate for bringing such misery to his island. Alcinous had his servants collect all the precious items given to Phaeacia from the deathless gods and brought them to the end of the river where Nausicaa had drowned. Alcinous began throwing his wealth into the sea in honor of his beloved daughter. All mourned the loss of the sweet child, soon servants of the palace and villages joined the king in his sacrifice. Lords came to throw in their own priceless items, the Queen as well. The King saw the crashing waves engulf gold, silver, and bronze, and could not help but imagine his daughter meeting the same downfall. He fell to his knees, tears bursting from his already swollen eyes. Nausicaa, who had watched all this happen as an apparition, wept softly as she felt herself being pulled towards the House of Death. Olivia Biggé is a junior at VHS. She prefers creative writing over analytical essays. The Odyssey was one of her favorite books from the previous year. She swims on the Girls Swimming and Diving Team. However, she enjoys swimming in the ocean more.